WARNING : GRAPHIC IMAGES OF INJURY ! Leave page now if you do not want to see them. Swords, spears and axes are tools for maiming and slaughter. 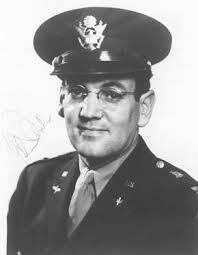 The purpose of getting an army into the field was to hack, cut and stab the enemy into oblivion. Sun Tzu - an ancient Chinese military strategist - not withstanding, it is not possible to win a bloodless victory without being prepared and capable to deliver real execution even though pure threat may theoretically achieve an objective. 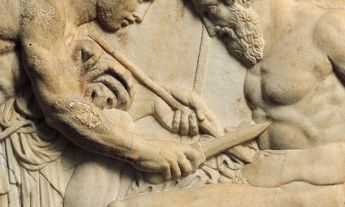 Ancient warriors were armed with blades for slicing and chopping meat and bone. With weapons such as these, and at close quarters, the process of killing was completely visible, audible and smellable ! Vegetius is also pragmatic to the ultimate degree when he gives us a stark reminder across the ages that most reenactor fighters, and indeed, most modern people, would have a severe psychological shock to overcome before they had the chance to wield a weapon against the enemy. Vegetius recognises that basic human nature rebels from the slaughter of close combat and warriors should be aclimatised to it or inocculated against horror in order to be able to function under the experience which was much more ' in your face' than a fire-fight at distance. To achieve this inocculation Vegetius suggests several strategeies: recruiting rural hunters and butchers used to slaughtering animals and dealing with blood and guts and sending recruits - even before they are of military age - on ambushes and plundering expeditions with veteran troops so they can experience killing without risking their comrades if they react badly. This same concept is echoed more than a thousand years later when we read in the romance 'Tirant Lo Blanc', published in 1490 - about the greatest knight in christendom - that squires training to be knights visit slaughterhouses to accustom them to the sights and sounds of battle. So one must remember that no matter how many times you have seen 'The Texas Chainsaw Massacre' or played ' Assassin's Creed' you should not kid yourself that you have the stomach to either face an opponent with meat cleaver in hand or to cleave his meat with said utensil. 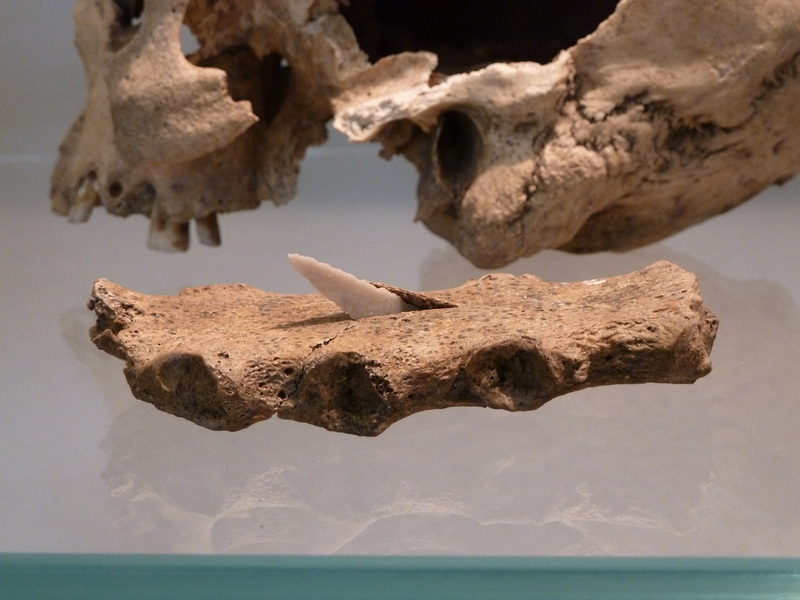 Skull from Tollense Valley, N.Germany with club/mace damage. Weapons are tools for killing and no amount of philosophising can escape the grim fact that man the toolmaker has developed tools for all tasks relevant to his existence and war, the nastiest social activity we have, has its tools too. It is often trumpeted by blade-lovers that the sword is the only tool developed by man just for killing others of his kind. This is actually very wrong. Thousands of years before some smart-arsed and overly gifted metal-smith managed to beat out a longer-than-usual knife, men had been spilling the brains of their rivals using stone maces.You cannot knock a nail in with a mace - even if nails had been invented. Maces are skull-smashers and perfectly effective on the brittle receptacle of the clever brains which had thereby created their own nemesis long before cutting became aux fait. Avoid reenacting this kind of thing! Assuming we have our weapon of choice and get into a scrape with an opposing bunch of humans in an equally blood-thirsty frame of mind, there are going to be consequences. This piece aims to enlighten you a little about those consequences. One aim might be to convince you that war is to be avoided. Another might be to allow you to appreciate more fully the nastiness, brutishness and potentially short lifespan our ancestors lived out. Certainly, one aim is to give you pause for thought when you laughingly fell a fellow reenactor with your blunt weapon and then carelessly give him 'one more for the road (to hell)' or even slay prisoners or wounded in a pageant. Reenactment brings the past closer. Reenactment fighters should not escape confronting the harsh realities of their activity's origins and have a responsibility to behave responsibly or they degrade what they do. HOW MUCH DAMAGE CAN THE HUMAN BODY TAKE ? The amputation of a leg is usually fatal from blood loss within minutes if nothing halts the flow. Most combat injuries would be messy but total amputations are well documented from remains. If an amputation received aid within minutes then they would have a circa 75% chance of survival for an arm lost and 15 % for the loss of a leg before the days of antibiotics. The further down the limb the amputation occurs, the better the chance of surviving it. The greatest killer would be shock once one began to understand the severity of one's injury. This combined with the blood loss would incapacitate the victim and pre-nineteenth century medicine could not do anything about it. If one is lucky, the large blood vessels constrict near the wound and clotting sets in rapidly. Remarkably, we have records of many millers who survived having an arm wrenched off after it was caught in mill machinery because they were aware of the risk, kept their heads and avoided shock. The nature of the injury did not introduce foreign matter into the wound and they staunched the bleeding quickly. A major wound to a leg or arm would probably not be survivable in an ancient battle just because the chances of getting to help were slim. If one was disabled then the likelihood was that the opponent wll get another blow in to make sure of you. If you go down in a melee then the chances of getting up again were small. In the Battle of Maldon poem Earl Brythnoth gets knocked down after a severe arm wound which cripples him and then he is despatched . A mounted man may have a better chance to ride away and seek help if he remains in the saddle. Any serious limb mangling would need medical amputation also, and the chances of surviving would, again be poor. Foot or hand amputation or partial amputation must have been common injuries in combat with swords and axes. Survival in these cases is much more likely than if the main limb is involved but infection would have been the big problem. There are many modern cases of people continuing to function or fight with hands or feet lost. In 2012 an Irish man punched his attacker with his bloody stump after the attacker had severed his hand with a samurai sword. A possible Neolithic amputee has been found in France. A blow to the skull is more likely to put one out of the fight at once. Statistically, a head wound is 3 times more likely to result in death than one on other body areas.Even with modern medicine any injury affecting the brain gives a 50% chance of death. 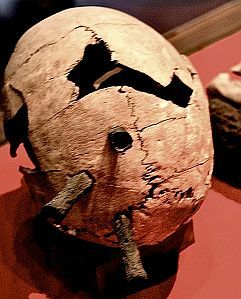 Not surprisingly, helmets are effective at reducing the effects of a blow to the head and despite their rarity in the archaeological record we can rightly suspect that those who could afford one did. One should remember, however, that even today there is resistance to laws forcing the wearing of helmets on motorcyles even though evidence and logic argue for their use. A blow to the cranium can knock you out instantly and the resultant fall from a horse or incapacitation in a melee would argue against your survival. Blows that are not instantly disabling could change one's mental state to anything from being drowsy to total amnesia. Again, not helpful in a battle. Bleeding in the skull would prove disabling in a short time. Wiggling about the penetrating weapon would also not do the victim much good. All in all brain-case hits are bad news. 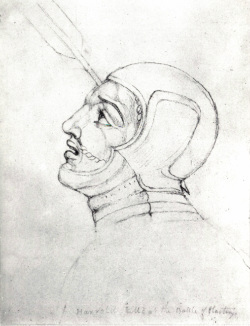 Harold with arrow as envisaged by William Blake. The head also includes the face and throat which the enemy has as a major target area. The eyes are the windows of the soul and also a shortcut into the grey matter. 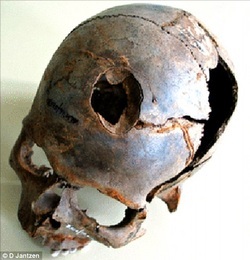 Arrows and spears would obviously blind even if they failed to penetrate the skull. It is not for nothing your mother used to say 'You'll have somebody's eye out with that! * In the days before cranio-maxilliary surgery the social effects of a sword in the chops would have been terminal in the long or short term and very nasty. Teeth and jaw being smashed would be very painful and likely to lead to infection and slow death. 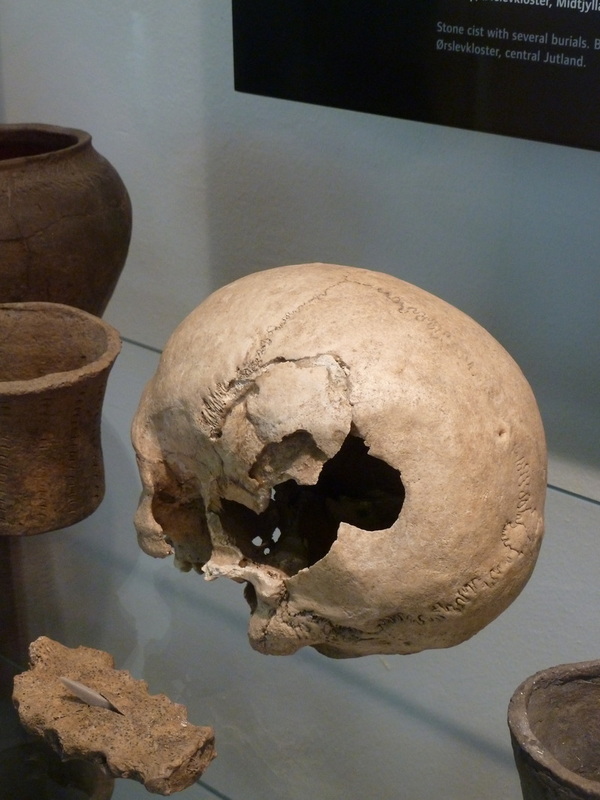 Many skulls have been found from ancient times with horrible facial injuries. Many references in histories tell of armoured men felled by an arrow or blow into the undefended face. The throat houses our airway and major blood vessels supplying the brain . It is not for nothing that animals are despatched with a cut to the throat. Injury to the throat would be rapidly fatal and very messy. I will not put images of throats cut or beheading up here. I do not even want to see them. If you want to then our Islamic friends have made sure you can after a quick internet search. Frenzied sword attack ? No, motorboat propellor - but similar effect. CUTS can be survived if they do not open major blood vessels or damage organs. Even quite monstrous looking wounds can, if allowed to heal witout becomng infected, be survived. Indeed, wounds which apear horrific can still allow a person to continue fighting. Ancient manuscripts show accurately the characteristic 'gape' of deep slashing cut injuries. Superficial but still serious wounds can be tolerated to a much greater degree than one might expect. As long as a person remains conscious and has enough drive to surmount pain they can continue. Deeper cuts may disable limbs and make standing or gripping weapons impossible. Muscle can be cut away and the victim crippled but cuts and slashes - but the type of wound delivered by swords are often recoverable using suturing, poultices and herbal treatments if the victim could get to treatment. Not so impressive, but more deadly. STABBING wounds, on the other hand ( or anywhere in the body, for that matter) , are more dangerous, especially in the days before surgery and infection control. Psychology is very important here. Many stab victims collapse through shock almost immediately regardless of the severity of the wound. Some retain composure and survive extensive wounds, others go into shock and die from less serious damage. We have already seen how a brain-penetrating injury is usually fatal. Penetration of the chest cavity is most dangerous if the heart is hit. There are unusual stories of people stabbed in the heart surviving long enough to run to hospital but generally a wound to the heart muscles or penetration causes massive blood loss, heart attack, massive blood pressure drop and rapid incapacitation and death. If you get stabbed in the heart you will be out of the game. The other dangerous target in the chest are the lungs. A 'sucking wound' which lets air escape will lead to collapse of the lung. This may be survivable if it is not extensive but the victim would struggle for breath, have a racing heart and in no shape to fight on. A more serious lung wound, with internal bleeding can lead to the victim drowning in a froth of his own blood. Post-battle survivors might expect to die of pneumonia. A stabbing wound to the abdomen can really open a can of worms. There are many organs to damage but also a chance that nothing vital is seriously damaged by a penetration. Catastrophic damage to an organ or blood vessel will render the victim hors de combat by pain and shock. On the other hand, some people survive attacks when they have been stabbed seriously dozens of times. A warrior in battle may have the psychological wherewithall to survive stab wounds which do not incapacitate him and keep functioning. The big decision would, however, be whether to keep fighting or run off and try to find a leech. Surviving the initial wound, however would be immaterial if the gut was pierced because death by internal infection would follow in a couple of days. The vast majority of patients recieved with stab wounds to the abdomen at hospital today require an extensive investigative operation to solve the problems caused by the wound. In ancient and medieval times all these patients (c.78%) would have died even if the obvious wound and evisceration could be repaired. Any penetration of the lower intestine untreated would lead to an excrutiating and smelly death. 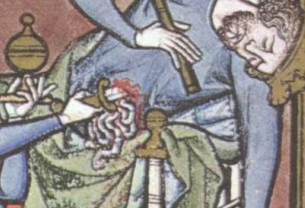 Expulsion of intestines through stab wound. And as the Maciejowski Bible saw it. It is not necessary to pierce armour or the body to inflict serious injury. Maces or a non-penetrating sword blow or spear thrust can wound by force alone. The head is most vulnerable. a blow to the skull can cause stunning or unconciousnes immediately. The skull can be fractured and bleeding in the cranium cause coma and death. Impacts on bones such as collar bone, hip, elbow, knee - that have littl enatural padding will cause intense pain and fracture thereby immobilising the limb. Long bones can be fractured. Blunt trauma often cause bleeding and swelling which will caus eintesne pain after some time and maybe shock and death. Even through armour, incapacitating blows can be struck. The force of impact can be sufficient to split skin and muscle to cause laceration even under clothing or protective wear. Neolithic skull smashed in on left side. With trepanation to treat wound. This man survived the injury. Not cuts but laceration after impact with blunt object. Each type of weapon has its own pattern of inflicted damage. It was well appreciated in the realm of medicine that certain weapons caused certain types of wound. 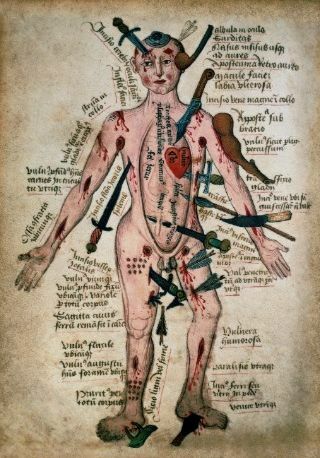 There are many surviving examples of this diagram, first devised in the late 15th century, which shows possible injuries to the body. 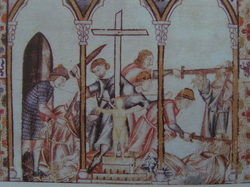 A pogrom under way in Spain 12th century. Swords. The spear, with its momentum focused on the tip can cause deep stabbing wounds. The blade can also inflict cuts when used in a lateral slicing motion.It does not require much force to penetrate the skin and once it is pierced the human body offers little resistance to a thrust if no bone is encountered. Sir Richard Burton's bayonet drill cautions against using more force than just the momentum of the weapon to achieve a deadly wound so as to avoid getting the victim stuck on one's weapon. Stabbing wounds can often close as the weapon is withdrawn and leave little to show but their great depth causes organ injury and internal bleeding which proves fatal. The victim may initially feel little more than a light impact. When the lungs or diaphragm are damaged the victim would be rapidly incapacitated as his respiration failed. 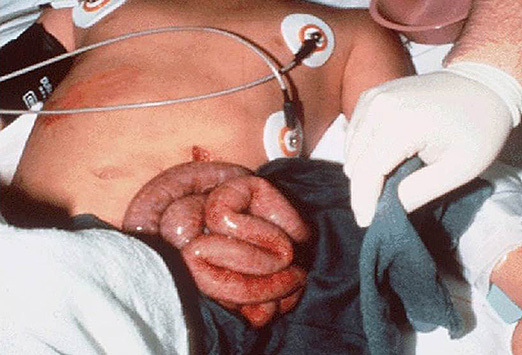 Serious bleeding in the abdomen causes rapid collapse. For some lucky victims a spear thrust could miss vital organs but the subsequent problems with infection would be great. One quarter of fatal stab wounds treated in UK emergency admissions at hospitals pierce the heart. A major wound to the heart causes collapse in seconds. A narrow wound to the heart can be as fatal as a major one. Some thrusts can take air into the great blood vessels and cause immediate collapse due to lack of blood supply to the brain and heart failure. Because the shield covers most of the body in combat and the spear was held at shoulder height in the hand it was the face and throat that were favourite target areas for a thrust. Earl Byrtnoth fells a viking with a thrust to the throat in the Maldon poem. 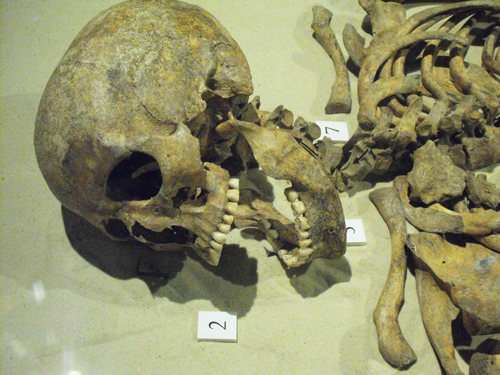 A skeleton from York of the same era shows a similar wound which shattered the second cervical vertebrae from the front. Horsemen must learn to be careful when spearing because it is easy to exert too much force and either break the weapon or unseat themselves. The momentum of the horse is enough to drive a spear through a victim. It is often suggested that mail cannot withstand thrusts very well but rivetted mail would hold out all but the most violent strikes. The tip of the spearhead may cause an injury but the deadly deep wound would be avoided. The sword can inflict amputations if the blade hits at speed. Long cuts are inflicted by the cutting edges or deep cuts by slicing actions. Although less used in the dark ages, the point can penetrate to cause deep stab wounds. Hitting the skull, a sword can have so much speed that its momentum will cause terrible deadly wounds. The sword is NOT the only tool which only has its use as the injury of people nor the first devised - that honour lies with the mace, but the sword is made from metal and is rather more cool. It is interesting that a sword is not necessarily the most effective tool for the job. A skull crack from a mace or body thrust from a spear will almost always kill. Swords of the Viking Period have points but they are weighted and designed for cutting and slashing rather than thrusting. The sword is swung and its weight driven at speed causes effective cutting. The sword is a long sharp bar of iron and bites into anything in its way. Swords are very effective at amputating or seriously disabling limbs and cut easily into skin and muscle. Even a short length of blade coming into contact with flesh will cut deeply when it is moving fast. Fingers, hands, arms and lower legs are easily severed by a well landed Blows to the torso or upper limbs will cause deep gashes even if they do not penetrate deeply. Cuts can be extensive while still not causing catastrophic blood loss or disability. 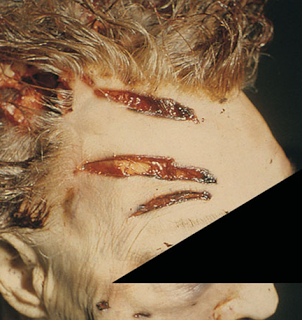 Deep cuts will sever nerves and sinews leading to immediate disabling of the victim. It is important to note that even cloth can hinder how a blade cuts into flesh; rawhide and leather certainly can. To fight with bared skin invites horrendous wounds from even incidental blows. Some light relief needed by now ? The axe has much greater momentum than other weapons and its impact is devastating. Even a shield would not necessarily save the hand or arm holding it from damage. The long-handled axe would shear through any part of the body it hit. The later axes have longer blades to have a broader area of effect and inflict wider cuts.Axes deliver great force in blows which cut, pierce and crush at the same time. Axe blows are usually very deep because of the speed and weight of the blow. Axe blows to the torso or skull will instantly disable the victim, cause massive blood loss and rapid collapse. Blows to the extremities will invariably amputate whatever they hit. The impact of an axe blade will cut easily through living bone. Blows with axes will more easily defeat armour and cause crush wounds even if they cannot cut. Axes made as weapons are often have relatively light heads but they can be swung so fast the impact is very devastating. A glancing blow with a sharp axe will still cause horrific cuts. Slings and arrows cause small entry wounds, usually, and kill by cutting major blood vessels and injuring organs. A glancing blow from a broad arrow-head could cause a long, deep laceration like a sword cut. Many ancient skulls have been found with arrowhead damage . Many more arrows must have found their mark in soft tissue. Arrow wounds are essentially the same as spear thrusts but on a smaller scale and delivered with more force. Arrows could fly thickly and warriors could suffer multiple wounds as they faced an arrow storm. Broadhead arrows cut so effectively through blood vessels and organs that they can quickly kill animals the size of buffalo. The effect if they pierced the torso of a human would be catastrophic. 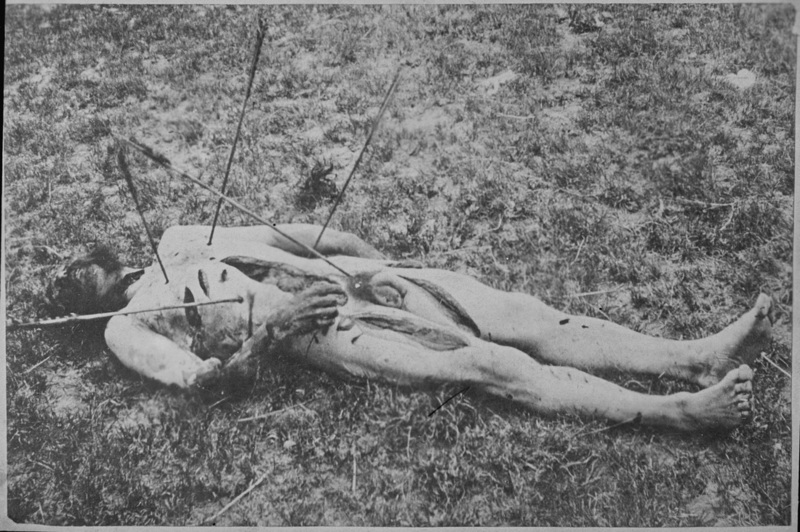 Whilst an arrow through the arm or leg may cripple such a wound can be survivable because of its limited size, an arrow in the body would rapidly disable a fighter. If an arrow hit bone in the ribcage or face then the victim may survive with a relatively superficial wound if he could avoid problems with infection. Poisoned arrows or arrows previously stuck in the ground would not help in such situations. But arrow shot with great force will pierce bone. The best defence was to keep arrows out with mail even though bodkin arrows may be used to defeat this. After contact with Arabic wargear in the First Crusade padding worn over the armour further helped to defeat arrows. A group of pathologists rated various suicide methods according to the pain the victim went through and the rapidity of death. The AGONY scale was from 0 (Painless) to 100. Time was rated in minutes. OVERKILL: FRENZY OR LOGIC ? There are many examples of skeletal remains showing many wounds. More than enough to kill. Archaeologists and journalists love to ascribe these to frenzied blood lust or psycopathic rage. I would suggest that these remains are evidence of neither. Rather, they are evidence of the grim realities of war. An injured man who falls or is left open to attack will be hit by his opponents until he cannot rise to threaten them again. Why let a wounded man stab you in the groin as you step over him? In the tempo of battle no one is checking if aman is dead, wounded or stunned. There are two groups of warriors - the quick and the dead. 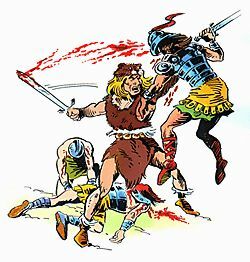 The quick will pummel, stab and cut an opponent until it is certain he has joined the other group. Until a man is motionless, bloodied and unreactive he will be struck at. In addition, if an enemy is downed, many fighters in his vicinity will want to share in his demise and add their blow regardless of the state he is in. Even men not involved in his felling may strike the body as they pass later in the battle just to make sure he is dead or out of spite. The extent of individual injuries such as the skeleton with both legs amputated from Visby or the horrifically smashed skulls from Towton are merely evidence that fighters are strong, well able to do their job, and equipped for it. Nothing more. Certainly nothing less. U:S: cavalryman despatched by native warriors. He has 5 arrows in him plus more arrow holes. He has at least 12 cuts, 6 extensive. He is disembowelled and scalped. Very dead but not necessarily the victim of a psycopath. The greatest killer must have been infection. Coupled with diseases which ran rife in an assembled mass of men on campaign who had poor sanitation and no concept of germ theory, infection could carry off even lightly wounded men. In the American Civil War 5/8 of deaths were from disease rather than combat. In the Crimean War 8 British soldiers died for every one lost in combat in the first year of the war. Especially in summer, flies would abound at a battlefield. Maggots could have a beneficial effect in removing dead tissue but flies can spread other pathogens. 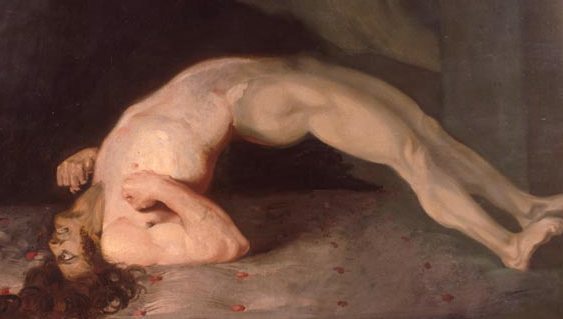 Tetanus was a feared killer until relatively recently. Caused by bacteria found in soil and horse manure. Abdominal wounds would give high rates of death due to bacteria from the gut escaping into the body cavity. The early medieval Lex Frisionum - Frisian Law - gives some insights as to the scale of survivable wounds and attitudes to wounding from 800 to 1200AD. Wounds are rated as to their length and compensation calculated accordingly. The longest wounds are 1 ell - elbow to finger-tip in length. Longer wounds were considered un-survivable. Bites and burns were measured before healing, other wounds, after. Wounds are treated by suturing (and compensated per stitch for the doctor's work) or by cauterising. Witnesses must attest that doctors do not deliberately extend wounds if they have to cut as part of the treatment. Wounds to the head had a premium applied - they were considered more serious. More visible wounds were compensated more highly. Penetrating wounds are compensated for per entry or exit wound combined with a value for the distance between them. Hewn-off pieces of flesh are measured around. Someone will always find a story which seems to indicate the human body can take a lot of punishment. Always investigate these stories to see what happened to that person ultimately. Even frenzied fighters receiving appalling injuries will succumb faster than in a Hollywood film. Psychology is very important - unexpected injury or horrific injury can cause death by shock alone. Knowledge that one will get medical help can sustain seriously injured people but in antiquity the opposite was true. Evryone would know that serious injury would likely lead to death. The sustaining thought would be to die honourably, complete a task or see loved ones. Some warriors may have continued fighting. Infection, blood poisoning and death would be the lot of many injured. A lingering and painful end. Warriors would be aware of this fate and some of those suffering serious wounds would have ceased to care and fought with great fury even after receiving a mortal blow. The corollary to this is that many would be deterred by a minor wound or just the threat of a major one. Some studies reckon that only 15% of soldiers in the Second World War fired their weapons in a combat. There must have been a pre-gunpowder analogy to this. Ten brave cheerleaders 'supporting' the man one step in front who actually chopped into the enemy? (e.g.) In the end, we cannot get inside their heads but we can recognise the gulf between the mind of a modern person and one brought up in the early medieval tribal world. 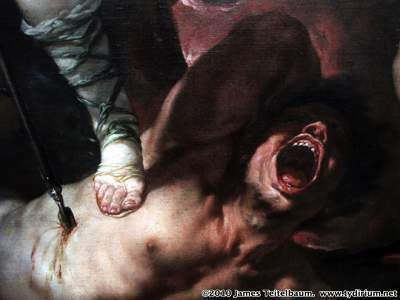 Receiving a wound could actually be a desireable outcome of fighting, but within limits. Outside the expected limits the victim could suffer shock. This character is a dervish from Muslim India. You may have seen the fake gurus and others sticking points through their cheeks, lips or tongue. 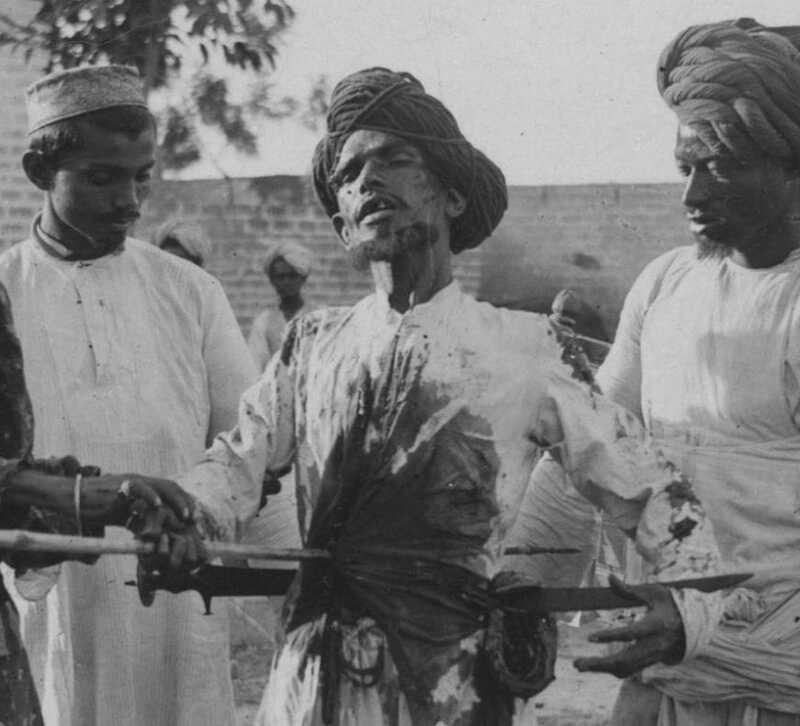 Up to the early 20th century the true devotees got friends to pierce their bodies through with weapons. This shows how one could be struck and survive, BUT. The BUT is that he was in a trance and not going to be shocked by the event. Second, they knew about avoiding organs. Every year at this festival some died from cutting major blood vessels or piercing the kidneys or other organs. Third, these dervishes often got sick afterwards and died. It looks bad. It IS bad. 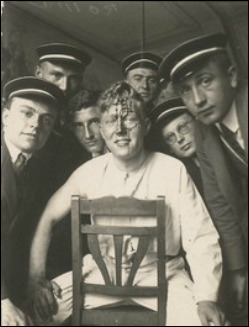 In the nineteenth-century universities of Germany and Austria-Hungary there was a tradition that members of Studentcorps - societies - should gain schmisse, scars of renown, by duelling with sabres . Armour was worn to avoid debilitating injury but the idea of the fight was to be damaged in the face - hopefully not too severely. We have little record of the 'failures' where maiming or infection gave a poor outcome. mm nice... Two good ones to excite the ladies..or maybe excite my 'brothers' in arms. Wunderbar! A suitably not-to-slashed babyface. Titus Livy gives us an interesting account of Galatian warriors who fought naked to show -off their wounds being driven to crying rage as they were felled from a distance by Roman slingshots and arrows which left small penetration injuries as opposed to the bleeding slashes they expected from their own tribal fighting. STAB to the heart, PENETRATION of the brain cavity, SEVERING of neck vertebræ. CUT to the throat or neck, AMPUTATION (or near) of limb, PENETRATION of major internal blood vessesl. CUT to sinews of hand, leg or arm, STAB to throat, PENETRATION of abdomen or lungs, any heavy blow to cranium. STAB to torso, disabling of right hand, disabling of foot, blow to face, arrow penetration. Even small wounds could kill through becoming infected. Wounds to the hands or feet - and to the face would﻿﻿ leave s﻿﻿cars and ﻿﻿disability﻿﻿ as a remin﻿﻿der of th﻿﻿e battle. The helmet's nasal and the rise of the 'halsberg/haubergeon' to protect the neck, ears and throat give witness to the fear of wounds to those areas. Wounds as a badge of honour would be welcomed but the border with unwelcome damage is a very personal thing. 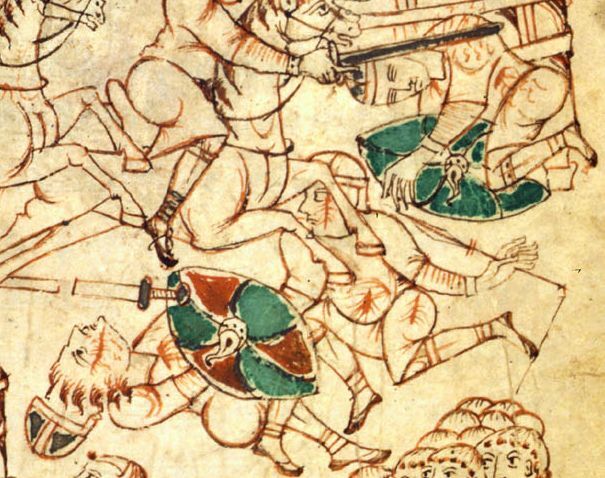 What can we say about combat wounds in the Viking Age ? We have the skeletal evidence discussed above. We have also a load of medieval references from saga materials which confirm any evidence from other times and places generally, but does not say anything specific about the Viking Age because they are not contemporary. The main conclusion must be that battle wounds are the same throughout history. Authentic accounts have the same ring down the ages. War is hell. There is no hell but the most horrible thing men witness is armed conflict so that is the model for the imagined place of damnation. Combat may have been very different in the later part of what we call the Viking Age because larger, more professional armies emerged. Tribal custom was overtaken by profficiency and the emergence of the fighting class. Armour became more prevalent and combat from horseback the ideal. Swords became more common but spears still dominated. The damage suffered in combat was potentially the same as it ever was. The eagerness of men to suffer wounding and death would have been the same. 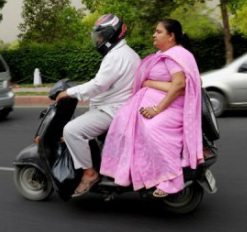 A few head-cases, naif and fanatics would rush in where men with a family and appreciation of life would fear to tread. If the opportunity presented itself then murder and massacre would be committed as eminently preferable to a straight fight. Any advantage was desireable. At the start of the age most fighting was done by a small troop gathered around a leader with power to whom they owed everything. Later it was a social class defending the accepted king of a state. The fighters had their existence nailed to the ruler's mast and they fell with him so it was essential to be aggressive, realising all was at stake in every combat. There is no honour in dying except what the victor chooses to give - and that honour does not illuminate the rotting corpses but reflects back onto the living. Win at all costs. War is not a game. As it ever was not. Typical warrior's end. Slaughtered in a pit. 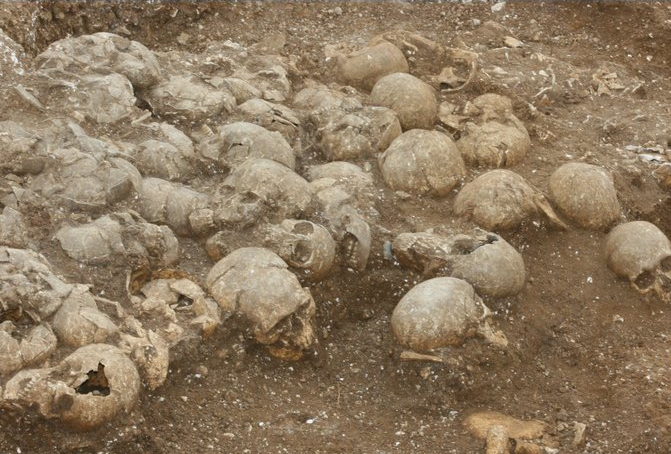 Norsemen's skulls found in Dorset. To the victor the spoils, to the loser - the soil.